George Graham Reviews Freey Johnston's "Rain on the City"
Melodic pop or power pop, in the tradition of the Beatles and others in the British invasion is a genre that seems timeless. Every generation since then has spawned artists and groups in the style. In recent years there has been good crop with bands like Fountains of Wayne, Daphny Loves Darby and its offshoot Wolftron, and the Red Button. Groups who do this music best tend either to be quite young and full of youthful passion and kind of obsessive quest for perfection, or older artists who have some memory of the original sounds in the genre. This week we have another first-rate recording that keeps up the tradition from an artist who has been on the scene for some twenty years now. It's Freedy Johnston, and his new CD, his first of new material in eight years is called Rain on the City. Forty-eight-year old Freedy Johnston grew up in a very small town in Kansas, some 30 miles away from nearest record or music store. But music became a calling when at age 16, he bought his first guitar by mail-order. After high school, he attended the University of Kansas at Lawrence, where at the time there was apparently an active New Wave music scene , in which he immersed himself. In 1985, he moved to New York City to try his hand at music there. By 1989, he was signed to the Hoboken-based new wave and roots label Bar/None records, and released a single that year, followed by his first full album the following year. To raise money for his next recording, he sold some of his farmland back home in Kansas. The result was Can You Fly which was a critical success. He achieved some commercial success during the 1990s recording three CDs for Elektra Records. He also was involved with creating music for some soundtracks. In recent years, his output has slowed, having released a live album in 2006, and a collection of covers in 2008. Now he is out with Rain on the City, and it shows him at his best with clever, often musically interesting songs with astute lyrics, fairly understated arrangements, and his appealing airy vocals which are perfect for this kind of well-crafted, thinking-person's pop. Like his previous album, My Favorite Waste of Time, that collection of covers, Rain on the City was recorded in Nashville. But it doesn't have much of a country twang to it. The producer was Richard McLaurine and the backing band was a rotating collection of mainly studio musicians, varying from one track to the next. Like much of the best of such pop, the songs tend to be succinct, showing off their clever ideas and ending leaving you wanting more. Johnston structures the album so that the songs tend to get more melancholy, at least as far as the lyrics are concerned, as the CD goes on. But there's a little bittersweet in almost all the tracks, some of which feature bright, sunny music accompanying downcast lyrics. 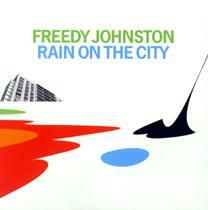 Freedy Johnston's new CD Rain on the City is firts-rate collection of intelligent, nicely-crafted, and often multi-layered melodic pop in a tradition that goes back a couple of generations to the British Invasion. Johnston has been on the scene now for 20 years, and this new recording is one of his best. Making music that sounds as effortless as this, and full of as many great musical ideas as this is not an easy thing. Perhaps that's why it was eight years since Johnston's last collection of new compositions. But it was worth the wait. It's a recording that will stand up to many listenings, and is very unlikely to sound like some expired fad in five or ten years. This kind of music has proven to be very durable and continues to find new generations of fans over time. Our grade for sound quality is an "A." The recording is sonically very clean and unencumbered by needless studio effects. And it has fairly decent dynamic range. The music can actually get soft at times, instead of being massively compressed as so much pop music is. Freedy Johnston has again proven himself to be one of the most appealing and skillful of the retro-popsters doing original music on the scene today.